One of the largest Greek banks asked Qualia to maximize the spread of a rumour in the social media concerning a fictional football player who was supposedly summoned by the national team manager to join the team. We selected a small group of influential opinion leaders that would accelerate the adoption of the initial rumour. We started with a seed list of journalists, athletes and celebrities who frequently post about sports on Twitter or on their blogs. We enriched the initial set, in an iterative manner. In each iteration candidates were re-ranked according to their importance in the community, that was measured as a function of followers, Klout score and centrality. We also filtered the candidates that were strongly biased in favor of a specific Greek football club or expressed negative emotions towards team Greece. We had covered 70% of the Greek Twitter domain until the rumour was revealed 36 hours later. 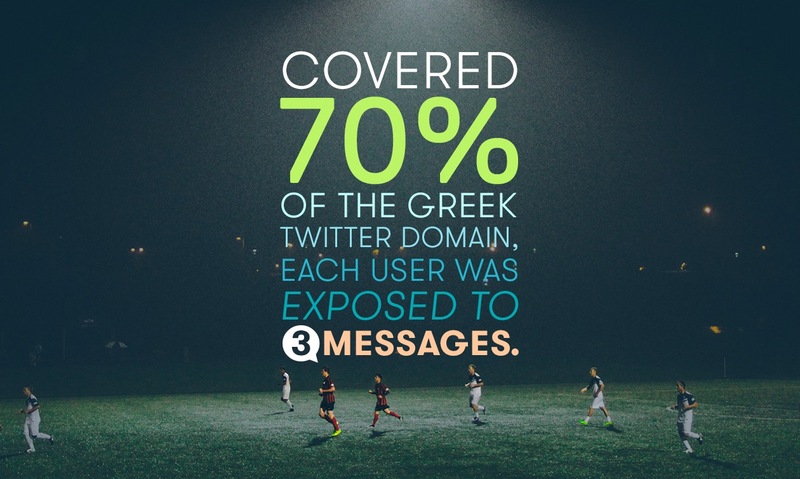 Each user was exposed to 3 messages which means that we had practically covered the active Greek Twitter domain 3 times. The video of the campaign reached 850Κ views on YouTube and 10K interactions on Facebook.